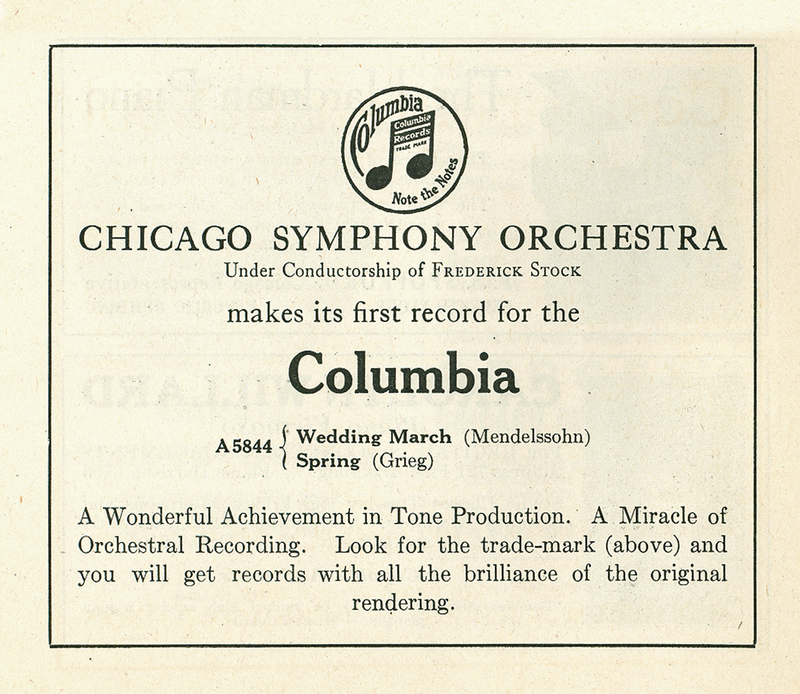 The Chicago Symphony Orchestra’s commercial recording legacy began under Frederick Stock on May 1, 1916. 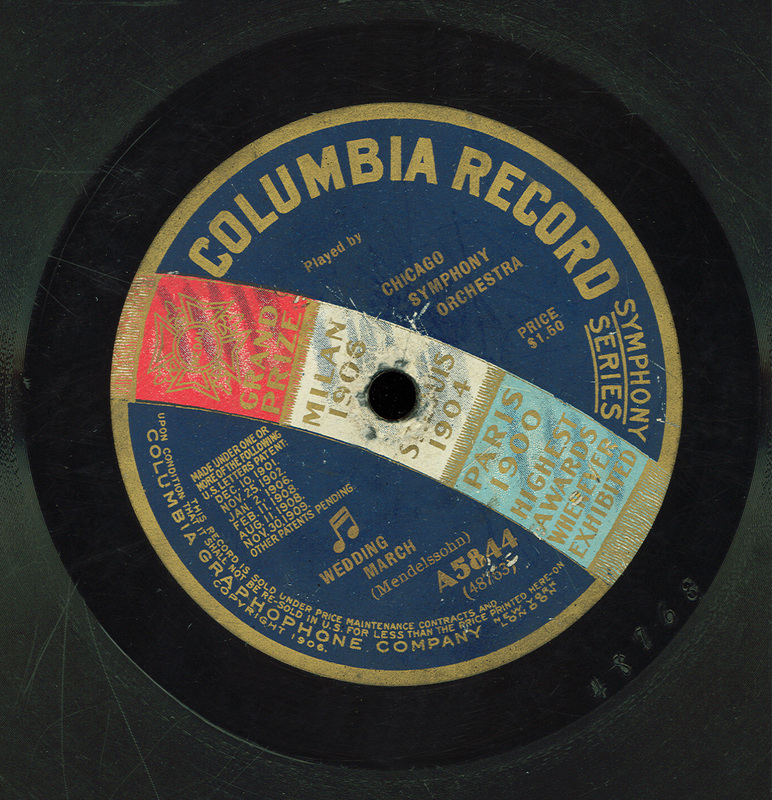 At that first session for the Columbia Graphophone Company (at an undocumented location in Chicago), they recorded Mendelssohn’s Wedding March from A Midsummer Night’s Dream; Wagner’s Ride of the Valkyries from Die Walküre; and Grieg’s Two Elegiac Melodies, Heart Wounds and The Last Spring. The next day, Stock and the Orchestra recorded Mendelssohn’s Nocturne from A Midsummer Night’s Dream, Saint-Saëns’s Bacchanale from Samson and Delilah, Tchaikovsky’s Waltz from The Sleeping Beauty, Järnefelt’s Praeludium, and Stock’s arrangement of Dresden composer and violinist François Schubert’s The Bee. They returned to the studio the following week on Monday, May 8, for one more day of recording in 1916: Dvořák’s Largo from the New World Symphony, Bizet’s Entr’acte to act 4 of Carmen and the Farandole from L’arlésienne, and Wagner’s Procession of the Knights of the Holy Grail from act 1 of Parsifal and the Prelude to act 1 of Lohengrin. Mendelssohn’s Wedding March was subsequently rereleased on From Stock to Solti in 1976 and again on Chicago Symphony Orchestra: The First 100 Years, issued during the centennial season in 1991.